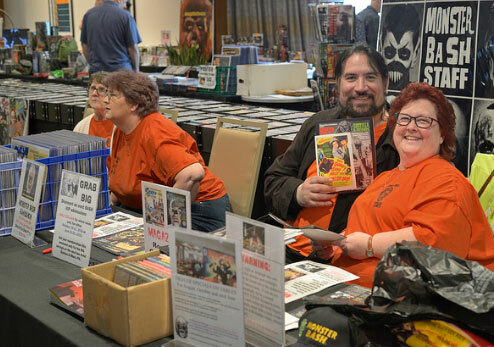 Photos provided by Phil Smoot, Bruce Tinkel, Michael Joyner, Linda Dello Stritto, Malcolm Gittins. 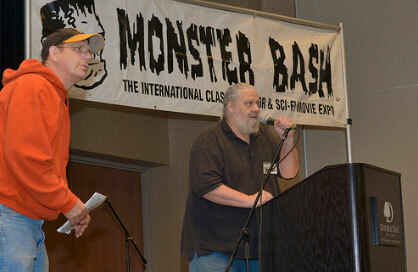 The Excecutioner and Bruce Tinkel...from The Pit & The Pendulum stage play at Monster Bash. Mike Adams introduces MURDERS IN THE ZOO....an outragous pre-code horror with Lionel Atwill. 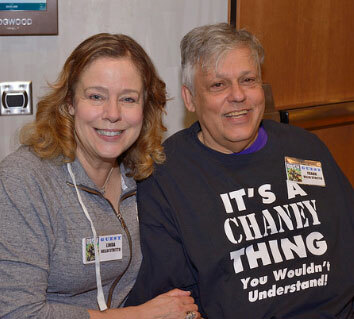 Fielding questions, the friendly registration crew, left to right: Susan Sherry, Barb Heiss, John Bishop, Mary Bishop. 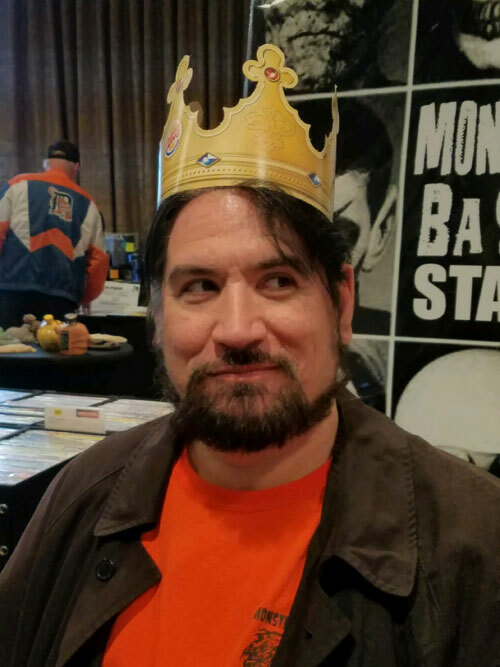 Introducing Mexican Monster Night at Monster Bash, it's Roberto "Bobb" Cotter.! 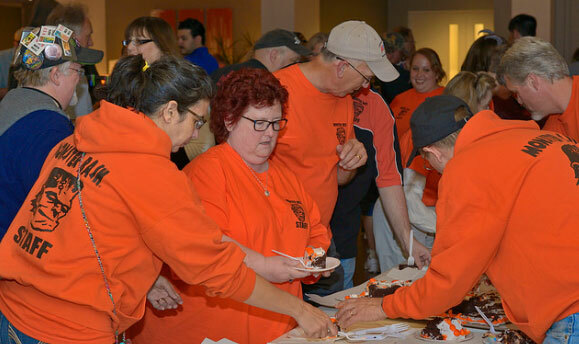 Cutting free cake in the lobby for hundreds of attendees, it Ursula and Rin Adams, Mary Bishop, Bernie Sherry, Tami Mizikar, Earl Lisk and Thom Shubilla all helping (the ones in orange!). More cake cutting in the lobby by orange shirted staffers: Ursula Adams, Mary Bishop, Bernie Sherry, Jenny Marshall, Pat Lisk, Ron Adams, Jon Doerr. Handing it out, as fast as possible, to massive lines of attendess. 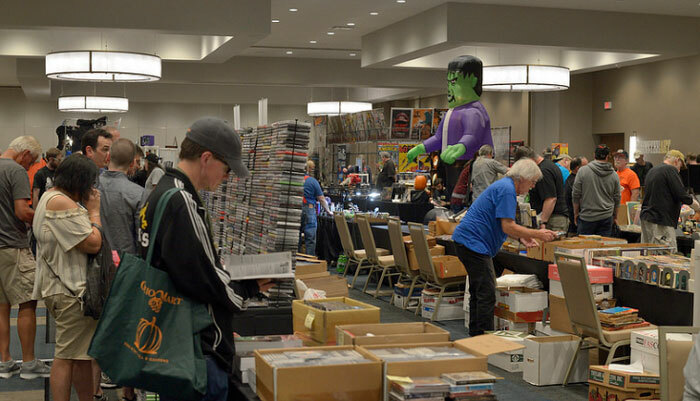 A small slice of the dealer room and all those cool classic monster collectibles. 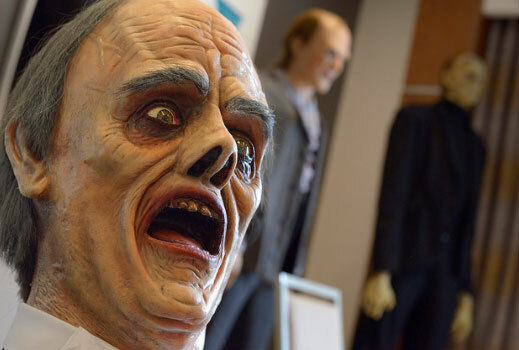 Just some of the awesome, life-size figures from Bill Luciani and Tony Pitocco. Stone doorway prop by Dan Weber. Lab set by Mike Adams. 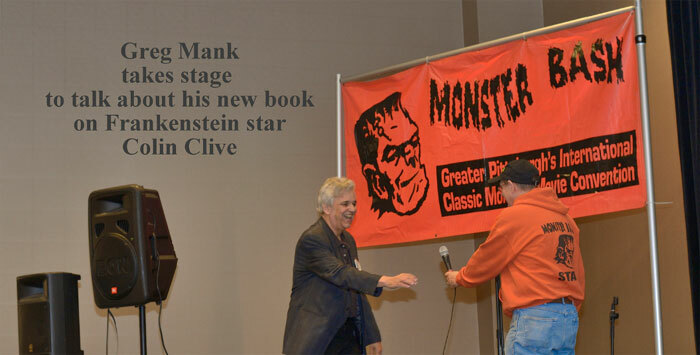 Author and film historian Greg Mank takes the stage to talk about the life of FRANKENSTEIN actor Colin Clive. 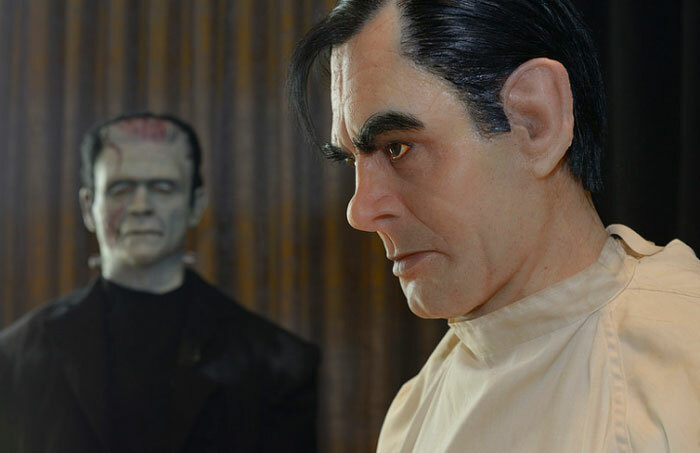 Amazingly realistic....The Karloff Monster and Clive's Henry Frankenstein from THE BRIDE OF FRANKENSTEIN. 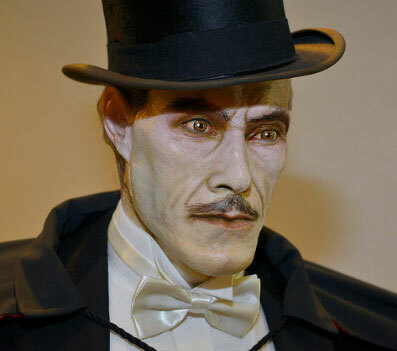 A detail of the life-size John Carradine Dracula figure. 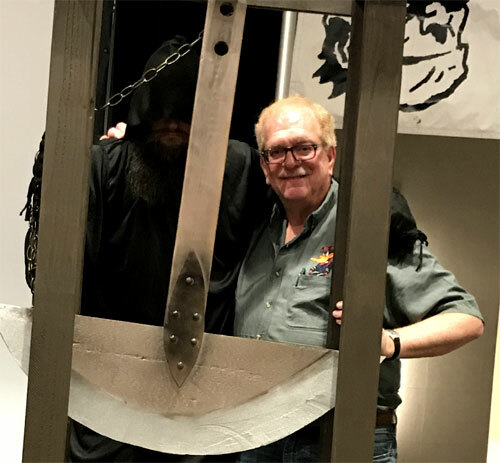 Bill Luciani (Maker of Monsters....errrr, men! 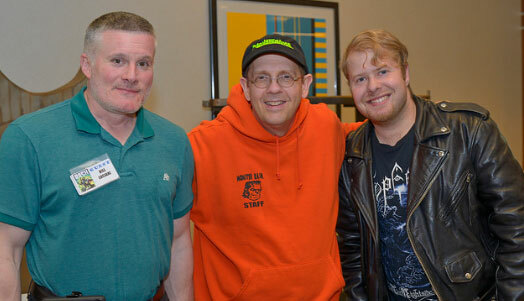 ), Ron Adams and long time attendee Dalton Smoot. 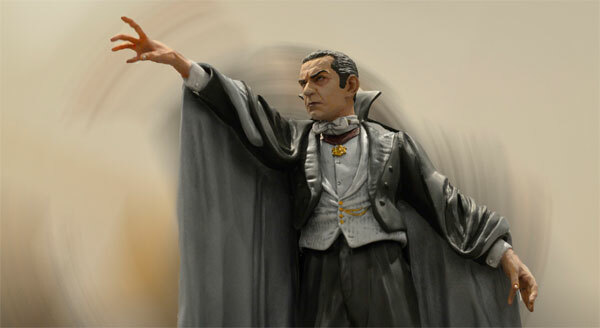 "I want my Monster Bash!" The Phantom in Bill and Tony's displays. Ron Adams interviews Leo Gorcey's daughter, Brandy as she dons her dad's hat. 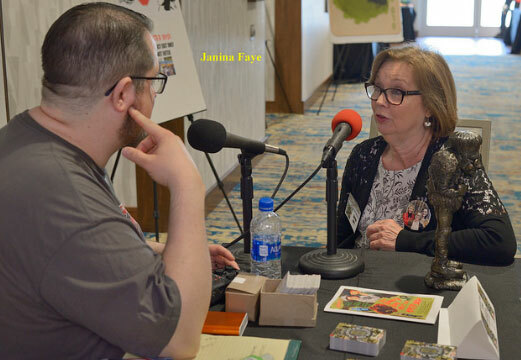 Derek Koch of Monster Kid Radio interviews Janina Faye (actress from HORROR OF DRACULA and DAY OF THE TRIFFIDS). Janina Faye and staff moderator Scott Goettel talk with a packed event room! Ron Adams with Kris Yeaworth on tage. Kris discusses his dad directing THE BLOB, DINOSAURUS and THE 4-D MAN. Plus, he performs his song about the making of THE BLOB. He was a tech on the set of the 1958 classic. A beautiful resin model at one of the vendor tables. 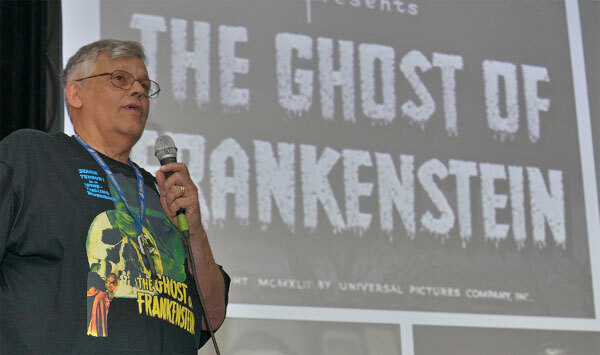 Frank Dello Stritto, author and film historian, gives an entertaining, in-depth look at THE GHOST OF FRANKENSTEIN. Linda and Frank Dello Stritto....you've gotta love Frank's shirt! 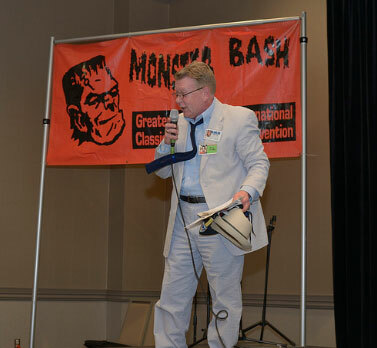 The Monster Bash Brain Twist Quiz...with host, film historian Tom Weaver! 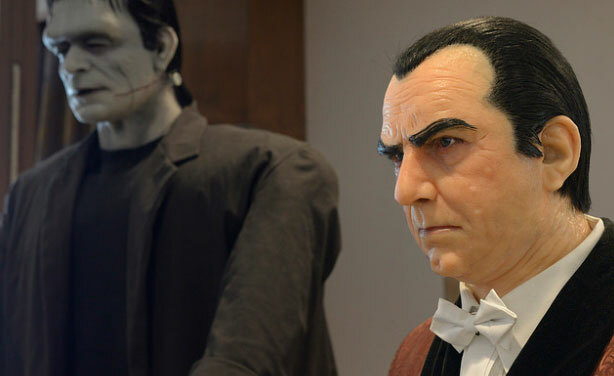 Glenn Strange and Bela Lugosi replicas (life-size!) from ABBOTT & COSTELLO MEET FRANKENSTEIN. Thanks to Bill Luciani and Tony Pitocco. 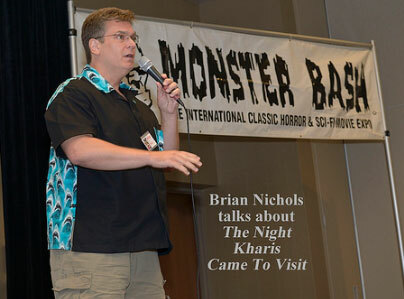 Brian Nichols, revs on some great memories he made with his kids....mummies and monsters and he has it on film. Amazing and touching. 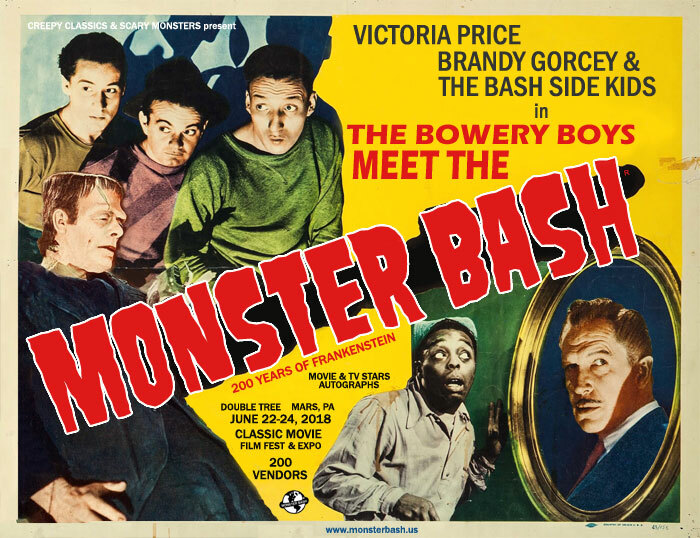 Having a wonderful Monster Bash...it's actress Sharyn Moffett (THE BODY SNATCHER with Boris Karloff) along with Ursula Adams and Ron Adams. 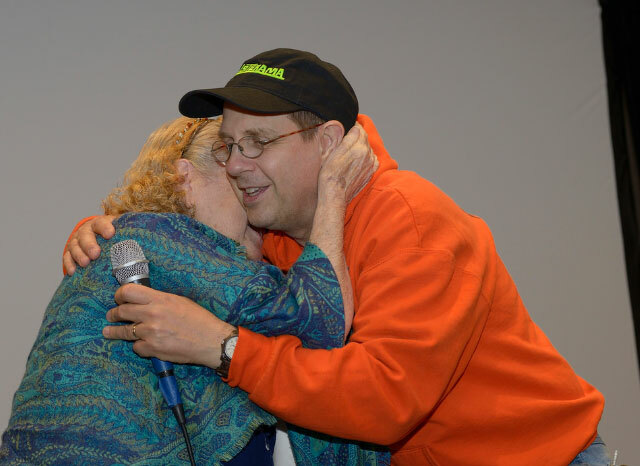 A great moment with actress Sharyn Moffett and Ron Adams at the end of a question and answer session. 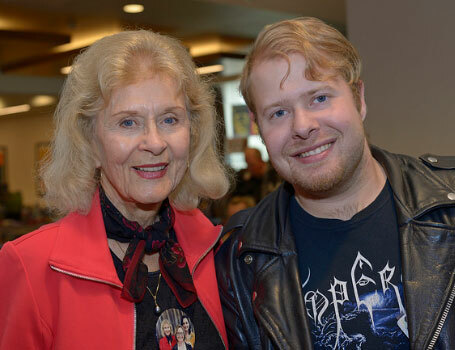 The lovely Joyce Meadows and attendee Dalton Smoot. 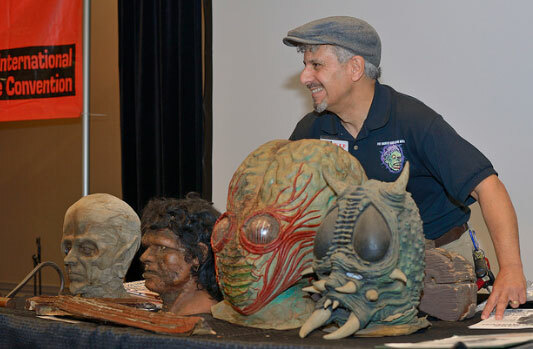 It's Monster Kid Show & Tell with Joe Vento, displaying just a few of his many movie props! 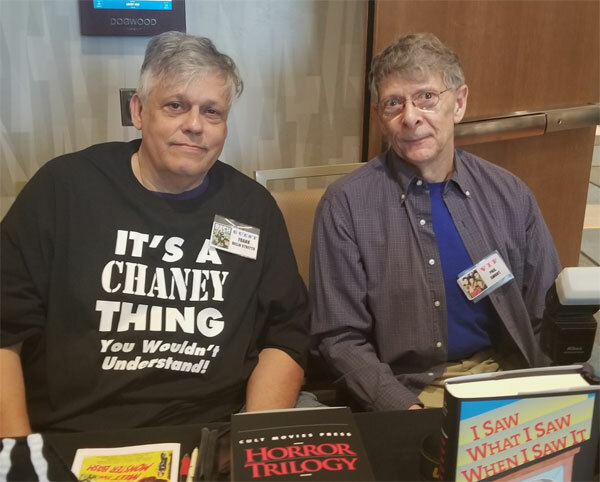 Author Frank Dello Stritto and veteran film technician and photographer, cameraman...Phil Smoot! 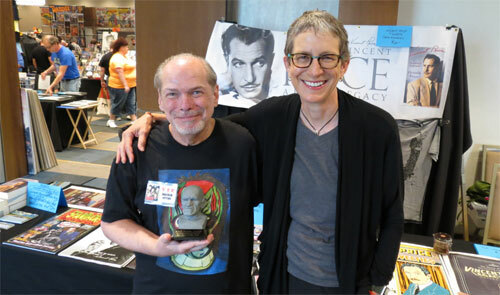 Award winning artist Malcolm Gittins (holding a Rondo Award!) and Vincent Price's daughter, Victoria. 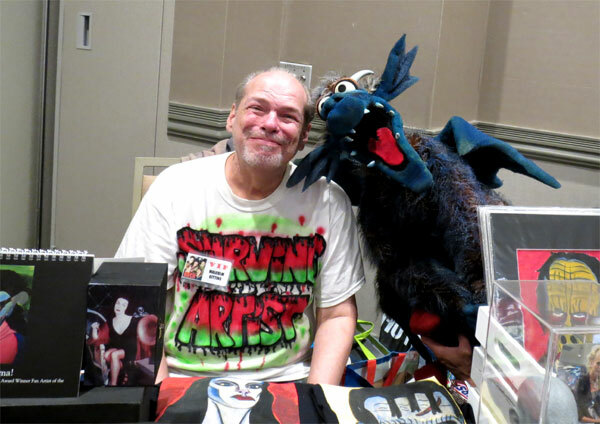 Malcolm Gittins, artist vendor at Monster Bash with Monster Muppet "Gorgo" courtesty of Bill Diamond. 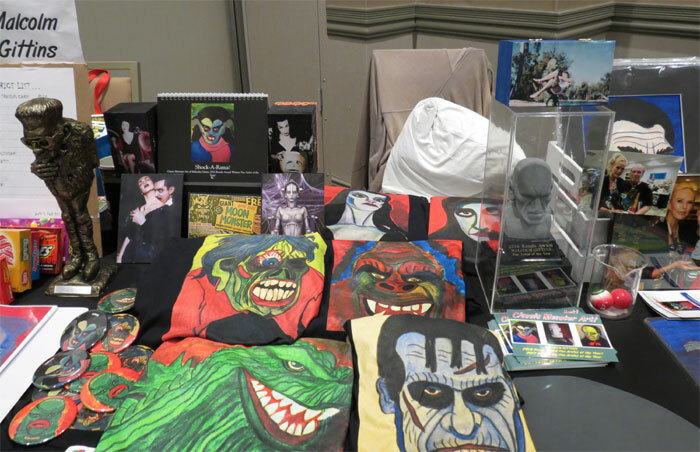 Retro Monster Kid goodies from artist Malcolm Gittins!